Hope For Cats is a non-profit organization, 501(c)(3) charitable no-kill shelter. We mainly trap, neuter, and release with feral colonies to decrease reproduction of strays. We find homes for the cats/kittens that are adoptable. Hello New Year! Who said that Christmas has to be over after December 25th?? You can have a Christmas celebration 365 days every year by adopting one of us. That’s right, our names were created at the most wonderful holiday. We’re Mistletoe, Christmas Tree, and Tinseltoes! Or, if you'd rather, just call us MT, CT, and TT. Either way, any one of us will make a delightful companion in a loving home. Christmas Tree was sick when she was rescued, but now she’s so much better. She will look you straight in the eye while she hugs you around your neck. If you want a silky black fur shoulder-hugger to supervise your Kindle reading before bedtime, Mistletoe is your girl! Now then, if you prefer a more active cat who loves to rough house, look no further than our brother, Tinseltoes. He would do great living with dogs who can match all that enthusiasm (he could do well as the only cat). You would never know that he’s the shyest one with long legs and silky black fur. Come see us! We’re no longer under the Christmas tree, but we’re sure to be a	gift in your life…. with or without that bow! ......at no cost to you! Our socialized cats/kittens are placed up for adoption. 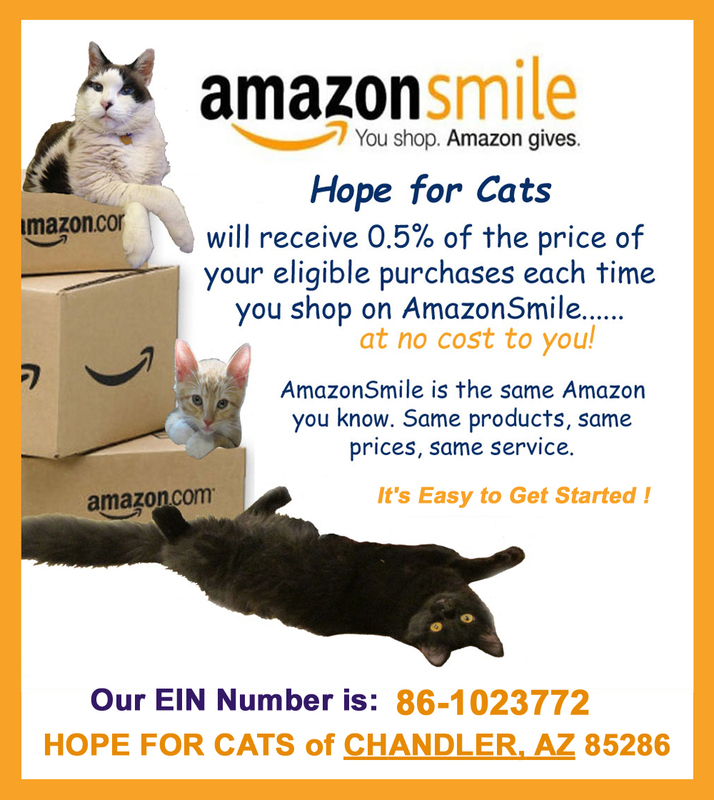 Please call 602-295-9237 for more information or to arrange a meeting with one of our cats. If you would like to make a donation, you can now donate on-line by clicking the Donate button found on our "How You Can Help" page. It's secure and your receipt will be e-mailed to you. 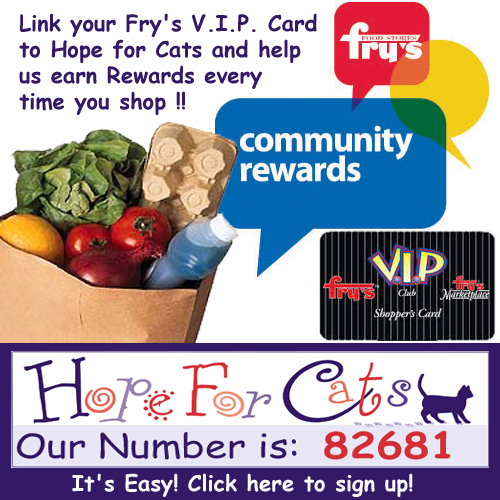 If you prefer to mail a check, please make your check out to Hope For Cats. Thank you! All donations are tax deductible and very much appreciated!